VANCOUVER, British Columbia, Canada, November 17, 2011 (ENS) – A Canadian environmental organization has launched a new automated system to draw public attention to the number and size of the oil tankers that transit Vancouver’s Burrard Inlet. Warning that a pipeline expansion proposal by Kinder Morgan could make Vancouver the major conduit of tar sands crude oil to China, the Vancouver-based Wilderness Committee is providing oil tanker alerts that people can receive on their cell phones. The service issues an alert when a tanker is preparing to fill up with crude oil at Kinder Morgan’s Westridge Marine Terminal in the Vancouver suburb of Burnaby, the terminus of the Trans Mountain pipeline system, which runs 1,150 kilometers (715 miles) from Edmonton in northern Alberta near tar sands production facilities. “This new alert system gives local residents a sense of the sheer volume of crude oil being shipped from Vancouver, and all the risk that brings, both in terms of a potential spill but also the risks of climate change that come with an expansion of tar sands oil exports,” said West. Tight pipeline space has been hampering Canada’s oil sands market, a problem that Kinder Morgan plans to address with a pipeline expansion proposal. For instance, Syncrude Canada Ltd., one of the biggest tar sands oil producers, produces 350,000 barrels a day from its northern Alberta facility but has had to delay shipments due to lack of pipeline space. Space on Kinder Morgan’s 300,000 barrel per day Trans Mountain pipeline was oversubscribed by 24 percent for December 2010, the “Globe and Mail” reports. 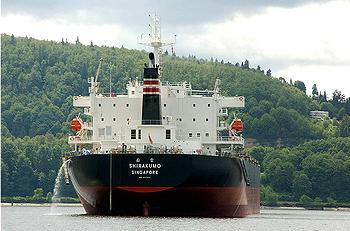 In March 2011, Kinder Morgan proposed to the National Energy Board of Canada that it be allowed to construct a twin pipeline for deliveries to the Westridge Marine Terminal on the south shore of Burrard Inlet that could boost capacity on the Trans Mountain pipeline to 700,000 barrels per day. 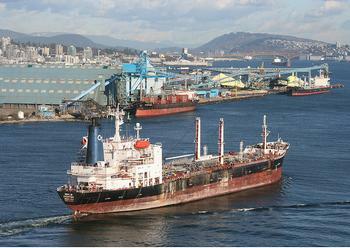 Currently, one or two tankers a week pass through the Burrard Inlet. Environmentalists fear that if the Kinder Morgan pipeline expansion is permitted, that traffic would increase to 288 tankers a year in 2016, nearly one tanker per day. While TransCanada’s Keystone XL pipeline proposal to carry tar sands crude from northern Alberta to the Gulf of Mexico has been an international news story, the Kinder Morgan pipeline expansion plan has received little notice. But that is about to change. In addition to the new cell phone tanker alerts, the Wilderness Committee now offers an associated Twitter account that provides more detailed information about when a tanker is passing under the Second Narrows Bridge, which spans the narrowest part of the inlet; when it is docked at the Westridge Marine Terminal; and when it leaves the inlet. The service provides information about the names and sizes of the tankers as well as information about how to get involved in the campaign to oppose oil exports from the British Columbia coast. A Power Point presentation by Ian Anderson, president of the Kinder Morgan Canada Group, says the Trans Mountain pipeline can be expanded in stages to access growing demand offshore in China. Anderson’s presentation shows that the company plans to dredge the Second Narrows channel to allow passage by large Suezmax tankers that can carry one million barrels of crude oil, four times as much as what was spilled from the Exxon Valdez in to Alaska’s Prince William Sound. These larger vessels will save shippers $1.50 per barrel, the presentation shows. 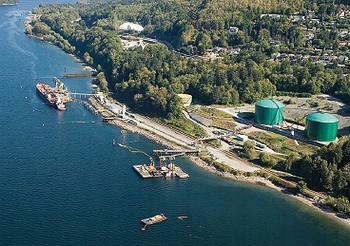 But environmentalists are determined to oppose the Kinder Morgan expansion. “The success of the campaign against the Keystone XL pipeline means there will be an even bigger push to turn the B.C. coast into the tar sands shipping port, and we want to make it clear that we are not going to let that happen,” said West. Also opposed to the Kinder Morgan proposal is Rueben George, Sundance chief and member of the Tsleil-Waututh Nation. George told the Vancouver City Council in July that Burrard Inlet waters are traditional Tsleil-Waututh territory and he objects to more tanker traffic through the inlet which increase the risk of oil spills. Vancouver Mayor Gregor Robertson acknowledged that the Council shares George’s concerns about the effect an oil spill could have on the region. Based in Houston, Texas, Kinder Morgan is one of the largest pipeline transportation and energy storage companies in North America with more than 37,000 miles of pipelines and 180 terminals. Kinder Morgan Canada is based in Calgary, Alberta.